Escambia, Santa Rosa, Okaloosa, Walton, Holmes, Washington, Bay, Jackson, Calhoun, Gulf, Liberty, Franklin, Gadsden, Leon, Wakulla, Jefferson, Madison and Taylor counties. Hamilton, Suwannee, Lafayette, Dixie, Columbia, Gilchrist, Levy, Citrus, Baker, Union, Bradford, Alachua, Marion, Nassau, Duval, Clay, Putnam, St. Johns and Flagler counties. 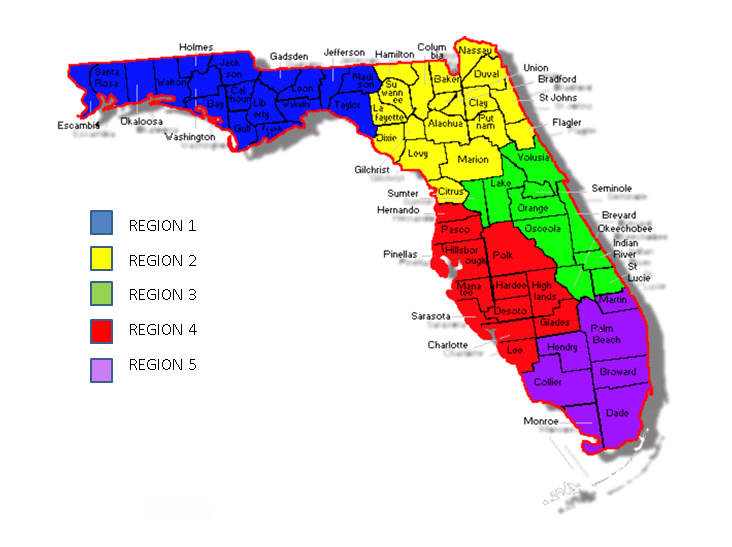 Sumter, Lake, Volusia, Seminole, Orange, Brevard, Osceola, Indian River, Okeechobee and St. Lucie counties. Hernando, Pasco, Pinellas, Hillsborough, Polk, Manatee, Hardee, Sarasota, De Soto, Highlands, Charlotte, Glades and Lee counties. Martin, Hendry, Palm Beach, Collier, Broward, Monroe and Miami-Dade counties.